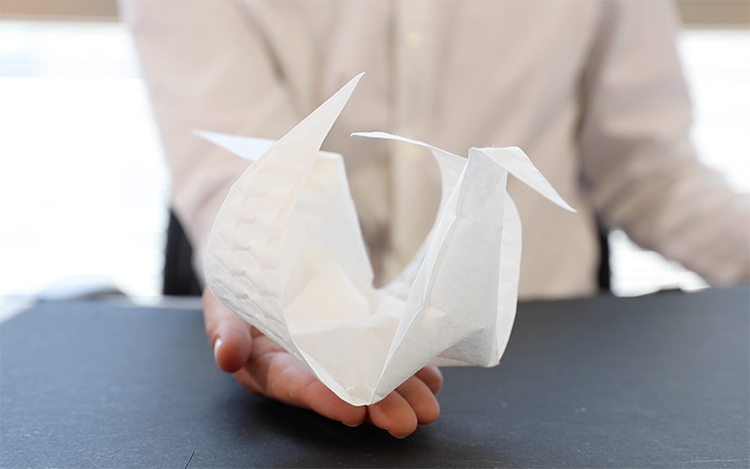 aeroMorph by MIT Media Lab‘s Tangible Media Group is a project that investigates how to make programmable paper, plastic, and fabric that can fold itself into origami shapes when inflated. The project investigates how to make origami structure with inflatables with various materials. We introduce a universal bending mechanism that creates programmable shape-changing behaviors with paper, plastics and fabrics. We developed a software tool that generates this bending mechanism for a given geometry, simulates its transformation, and exports the compound geometry as digital fabrication files. A custom heat-sealing head that can be mounted on usual 3-axis CNC machines to precisely fabricate the designed transforming material is presented. We envision this technology could be used for designing interactive wearables, toys, and packaging industry.